Having a family of allergy-sufferers, and being one myself, I was delighted by our symptoms’ improvements once I learned how to wash pillows. It’s not just that they smelled better, though that was certainly a nice benefit. Washing our pillows got rid of pollen, dander (both human and pet), and dust mites — three things that wreak havoc on allergies. It doesn’t seem at first like pillows should collect pollen. After all, they’re covered by pillowcases which you’re changing as part of your bedroom cleaning routine. But pollen hitchhikes on hair at bedtime then through the pillowcase fabric while we sleep. The same goes for pet and human dander. As for those dust mites? Those things are tiny — as in 0.2–0.3 millimeters (0.008–0.012 inch) — and they love humid places like warm pillows where they feast on dead skin cells. After that feast, they excrete a substance that causes severe allergies in certain individuals. Guess What Else Is in Your Pillows? Over one-third of the weight of a 2-year-old pillow is composed of skin flakes, dust mites and their droppings, and other microorganisms. It can even contain the microbes that cause flu, chicken pox, MRSA, Clostridium difficile (c. diff) and also e. Coli. And we sleep on that stuff! So, here’s how to wash pillows to cleanse them of such things. Regular laundering also means they’ll smell fresh and last longer, too. Here’s how. • If your pillows are grimy from body oils, follow these tips. • Foam-core pillows can’t be washed. To kill dust mites and reduce allergens, spray them lightly with hydrogen peroxide (do not saturate the core) and run them through the dryer for 10 minutes on the high heat setting. • Using a hypoallergenic pillow cover will protect your pillows but you’ll still want to run them through the dryer with tennis balls to fluff them occasionally. * You can replace this with 1/4 cup household bleach, but the scent of bleach irritates many peoples’ allergies and asthma. 1. Fill the machine. For top-loading machines, add the detergent, oxygenated bleach, and Borax to the machine then let it fill using HOT water. For front-loading machines, put the pillows in the washer with the Borax and follow your machine’s instructions for adding the detergent and bleach. 2. Add the pillow(s). For top-loading machines, carefully submerge the pillows in the water, arranging them so they’re on either side of the washer’s tub. Regular-sized pillows should be washed two at a time to keep the machine in balance. King-sized pillows should be washed individually unless you have an extra-large washer. 3. Run the cycle. Run the load on the longest, hottest cycle your machine has. Be sure to use the hot rinse cycle, too. 4. Rinse again. Once the cycle has finished, rearrange the pillows in the machine and run a second HOT rinse cycle, without additives, to get rid of any remaining suds. 5. Dry them on hot. Transfer the pillows to the dryer. Add the tennis balls to the load to fluff the pillow fibers as they tumble dry. Run the dryer for 60 minutes, pausing every 20 minutes to shake and rearrange the pillows, so they dry fully without clumping. If you prefer to line-dry, hang pillows from the long sides and rotate them every 20-30 minutes. Fluff them by hand once they’re dry, or tumble them in the dryer on the no-heat setting. Wash pillows after the person using them has the flu, strep throat, or other viral illness. Wash pillows seasonally to keep dust mites under control and reduce allergens. Even with seasonal washing, pillows should be replaced every 2-3 years. Hi, a hot wash is subjective. Washing over 60C will kill dust mites. 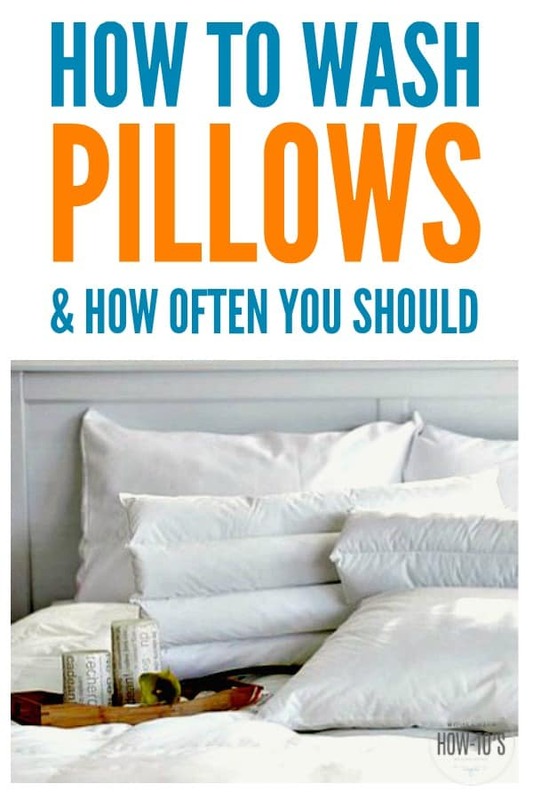 Great tips but my pillows are duck feather/down and they’ve gone yellow with sweat. I’ve never washed pillows before but the ones I have are perfect for me, and are still in good nick, so not willing to throw them out. You seem to be talking about synthetic pillows, will your method be safe to use with duck feather/down? This method works for feather/down pillows, too, so long as their fabric exterior is in good shape and free from tears. You’ll want to be sure to rinse them a second time, and use tennis balls in the dryer to fluff them. That also prevents them from clumping and developing mold. I CAN’T GET BORAX HERE IN THAILAND. WHAT ELSE CAN I USE INSTEAD?? I WASH MY PILLOWS EVERY5-6-7- WEEKS. I HAVE TO LOOK IF I CAN USE 60 DEGREES. P.S. DID NOT DO YET THE WATERSTAINS OUT OF THE SILK YET. Baking soda will work, too, Louise. Sorry, I’ve been running behind in my blog reading, but I have a question for you on this, Kate. Your directions for washing the pillows seem to be directed to traditional washing machines. Our relatively new high efficiency washer doesn’t work the way you describe. Any suggestions on how to approach this task using this type of washer? It’s still the same principle, Boyd: wash two at a time, then use a second rinse cycle. With HE washers you should use the recommended amount of detergent and add the same amount of Oxyclean and Borax.